This unique strategy game will have you clawing your way to victory as you live the life of a cat. Claw your way to victory as you live the life of a cat. The unique card-based strategy game will have players collecting human affection, making mischief, and fighting for dominance at the cat bowl. Maybe you'll choose to climb the curtains, scrounge up a midnight snack, or take an irresistibly adorable catnap. But be alert! This is a feline free-for-all, and the other cats in the game will do anything to stop you. 2-6 players, ages 8-80. Created by Al Gonzalez III, Elise Spacek, and Shawn Strider. Made in China. Al Gonzalez III, Elise Spacek, and Shawn Strider are best friends and designers. And in 2013, they were also starting to get bored. They were making art for clients 9 to 5, but wanted to break out and do something that let them be creative on their own terms. For their first collaboration, they drew inspiration from experience working in the indie game design scene, and also their shared history of pet cats. They realized that, while they had played plenty of cat-themed games, they had never seen a game that captured the experience of cat behavior. 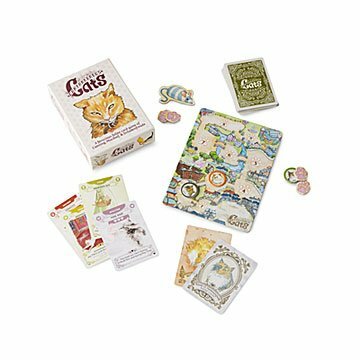 They put their collective talent to work, and their creation has been catnip for both cat lovers and card players. (7) Cat Cards, (7) Cat Tokens, (8) Pounce Tokens, (1) Turn Indicator, (1) Score Card, and (1) instruction manual. These cards are adorable BUT... the directions for this game are super challenging to decipher. I bought these for a holiday gathering with friends and decided the Hub and I should try out the game first. We looked at all the rules and neither of us could make heads or tails from the enclosed rules. So, we watched a YouTube video from the maker and a review from a user. This helped clarify a bit. We are going to watch the videos again and see if we can figure it out. If not, it will be regifted to a friend who is a dedicated gamer. We'll see if she can figure it out. This is a card game, and can be played by 2 or more people. Couldn't get through the directions. Frustrating! Was excited to give to older grandsons to play with family and siblings and family cats but they still haven't played . Recommended to a friend but they gave up with directions too. Disappointing. Illustrations etc. were fun and tempting. Didn't get a chance to play this - lots of rules and with me being sick and also playing with my 84 year old mother-in-law; we decided to go with something easier! Bought this as a stocking stuffer for college aged daughter who loves cats. We tried to play it but the instructions were very difficult to follow and not intuitive. Fun game. I used this as a stocking stuffer for Christmas. This project is a great gift idea for silly and fun family entertainment.